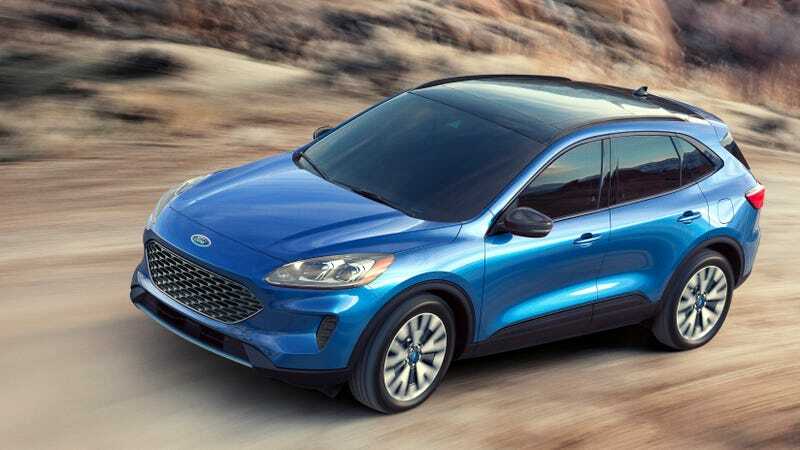 The 2020 Ford Escape looks a lot like a Ford Focus now, which I’m sure you noticed. It was never really an off-roader, it didn’t even pretend to be, but now it looks even more like a car because it has to get out of the way of the upcoming so-called Baby Ford Bronco. This repositioning also leaves space for an upcoming crossover, which Piaskowski says will be similar in size to the Escape. Known colloquially as the “baby Bronco” and seen in some leaked images, this model will be considerably boxier, taller, and is intended to give off more of an off-road-ready vibe. This is despite the fact that it will ride on the same unibody FWD/AWD architecture as the Escape. You’ll remember that Ford announced it was cutting all of its cars and hatchbacks in the U.S. market (save for the Mustang) a year ago. At the time, the company claimed consumer demand for its cars was down and the models weren’t very profitable. Then-new Ford CEO Jim Hackett’s mission was to make the company as profitable as possible, so ix-nay to all the ars-cay. As for this Baby Bronco, Reuters reported it will be based on the Focus Active platform and share parts with the new Escape. Alleged leaks of the design a few months ago showed off a somewhat boxy, very retro look. It probably won’t actually be called the Baby Bronco, but there’s another, larger, actual Bronco also coming soon, so it’ll need a different name. Why Is There a Fake Dodge Charger Taillight on This Cadillac CT5 Prototype?